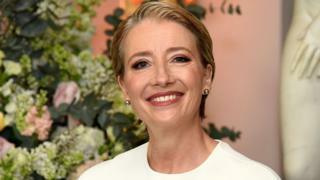 Emma Thompson has spoken for the first time about why she isn't taking part in the upcoming Love Actually sequel. A 10-minute film is currently being produced to raise money for Comic Relief. Thompson appeared in the original 2003 film as the wife of Alan Rickman's character. But in light of the actor's death last year, Thompson has said it would be "too sad" and "too soon" to revisit her character. "Richard [Curtis, the writer] wrote to me and said 'darling we can't write anything for you because of Alan' and I said 'no of course, it would be sad, too sad'. "It's too soon. It's absolutely right because it's supposed to be for Comic Relief but there isn't much comic relief in the loss of our dear friend really, only just over a year ago. "We thought and thought but it just seemed wrong but to revisit the wonderful fun characters of Bill Nighy and Hugh Grant and Liam [Neeson] and all of that, that's fantastic but obviously what would he [Richard Curtis] have done?" Speaking about what might have happened to their characters Karen and Harry, whose marriage is rocked by Harry's affair with a colleague in Love Actually, Thompson added: "Both of them would be in therapy by now and I would be working on some kind of ward. "It was absolutely the right decision." The short sequel, which will be broadcast on BBC One on 24 March, has already begun filming. Rowan Atkinson, Liam Neeson and Thomas Brodie-Sangster (the now-not-so-little boy from the first film, who also stars in Game of Thrones) have been seen shooting their scenes. Atkinson returns as the shop assistant Rufus, who was painfully-slow at gift wrapping in the first film. He now appears to be working in a supermarket. Hugh Grant, Martine McCutcheon, Keira Knightley, Liam Neeson, Colin Firth and Bill Nighy are among the other actors reprising their roles. Read more about Red Nose Day Actually.